How do I assign a circle to a list? There is a pulldown menu under Circle. Initially it says “Public”. 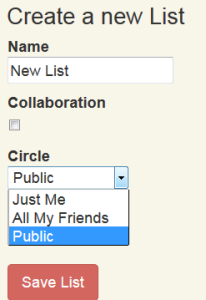 It will contain your available Circle names as choices. Select it and voila your list belongs to that Circle. Please note that you are given three choices from the beginning, Public, All My Friends, and Just Me. These are self explanatory, we hope. As you create circles, your choices expand.